This is the 3rd square of the 2018 Knitterati Gradient Lapghan. 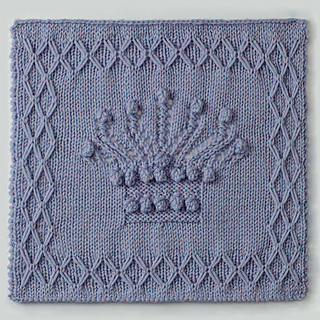 A fitting crown for this Cascade Yarns® square pops against the stockinette-stitch background. Elongated stitches form the lattice border. 20 sts x 26 rows = 4” (10 cm) over Stockinette stitch using US 8 (5.0 mm) knitting needles.